In October 2017, Steve and Chrissie launched In Conversation With, a series of interviews with members of the film-making and literary communities, distributed online. The following month, All Bad Things… received its first public screening at the second Grindhouse Planet Film Festival in Leicester, UK. They were recently commissioned by a major UK film distributor to produce a documentary extra for a Blu-ray release scheduled for early 2019. For information on our previous releases and works-in-progress, go to Projects. For the latest news, see the front page. 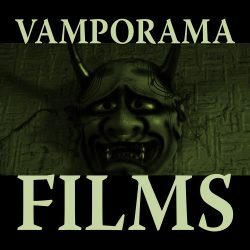 Network XXIII is just a mascot imprint Vamporama Films uses for selected projects aimed at possible television syndication. We think it has a ring to it and the logo looks nifty!